This is going to be my NINTH year of One Local Summer which is pretty incredible. Last year, I ended kind of abruptly at week 13 after we found out that my dearest girl-dog, Mattie, had a fast-growing, incurable cancer and was given two weeks to live. She made it 5 more weeks post-diagnosis, but it’s safe to say that she became my top priority at that point in time, and One Local Summer just didn’t seem that important when pitted against the pup’s health situation. After she passed, my heart was broken, and really, still is. I spent more time with her than I have with my husband who is out to sea for work more often than he’s home, so it’s been incredibly difficult to deal with the loss of a beloved pet, confidant, and the best, most earnest listener ever. Her brother is still around, but he’s always been a more aloof sort of dog whereas Mattie would take every opportunity to weasel her way onto your lap (yes, all 50 lbs of her) to beg for head rubs or just to curl up and snore her happy little face off. She was my little peanut and I miss her tremendously. That’s a long way of saying we had a loss in the family, and I couldn’t focus on much else since I was grieving. 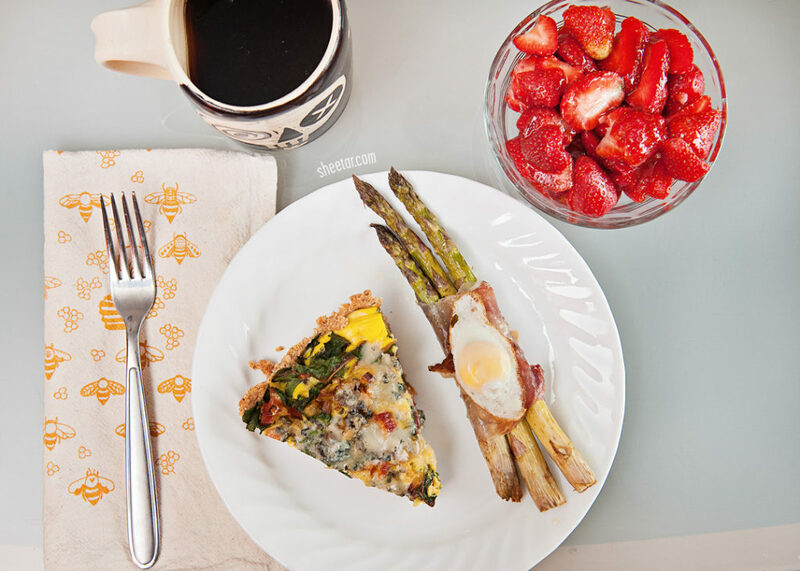 In case you’re not familiar with One Local Summer, the idea is that you make one meal a week using only ingredients found locally which serves to reduce your “food miles” by using food grown and raised near home instead of across the country. It means that your food uses less fuel to get to your home, reducing your overall carbon footprint. It also means that you get to know your local farmers, purchase from local small businesses, and support local agriculture. Getting to know the people who grow/make/raise the food I eat has been such an incredible experience over the past nine years – I joke that our local weekly farmers market is my farmers market family, and they’re a wonderful group of people that I enjoy seeing every week! I’m going back to the meal-by-meal format instead of doing set weeks. Let’s face it, some weeks get away from me, and rather than feel stressed to cook and blog about it when I’m just out of time and energy, this gives me the option to double up some weeks, and give myself a break other weeks if I need it. I kind of can’t believe it’s been nine whole years of this already. Our market went to regular summer hours at the beginning of April, so I figured I might as well start this thing off at the same time, even though it’s a month earlier than the usual start of our market summer season. The market is still on in the winter on an every-other-week schedule since a lot of producers grow in hot houses. There’s not all that much available at the beginning of the season in terms of vegetables – lots of leafy greens, but not too much else – so the earlier meals end up being a little simpler. Well, not this one! I found a recipe for baked empanadas that had a great, easy recipe for the dough that was basically just lard and flour, so I knew I could do that locally. For the filling, I deviated from the recipe and decided on veal, spinach, scallions, and cheese curds and it was PERFECT. Really, you could fill the dough with just about any combination of veggies/meat/cheese/etc and get creative with these, so I may re-visit this recipe later. I made the filling and dough the night before so they had enough time to chill and then assembled them the next evening. It’s a bit more work than I usually put into a One Local Summer dinner since I don’t necessarily enjoy cooking (a girl’s gotta eat though), but the result was well worth the extra time! I added some mushrooms and cheese curds to round out the plate since hey, mushrooms and cheese curds, who could say no?! The wine glass features mead I made from honey from our hives, so that was an extra special treat. I actually have TWO this week for One Local Summer, so I’m jamming them into one post instead of splitting them into two. This week was husband’s final week home before going out to a ship for quite a long while, so he took advantage of the time home to cook up a storm. This is me, not complaining. First up! 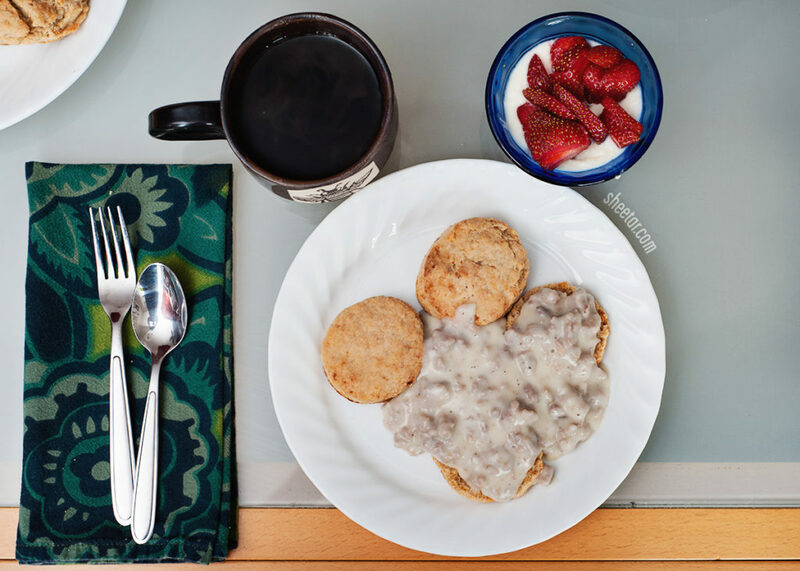 A house favorite, biscuits and gravy with a side of yogurt and strawberries and of course, coffee. We made our biscuits with lard – I have no idea where the recipe came from, but if I find out, I’ll add a link – and they come out so delightful. We had the buttermilk for the gravy and it felt like it would be a slight not to include it in the biscuits as well. The flour is probably my favorite part of this. We actually have an old stone mill locally that buys their wheat from PA farmers and then mills it with a gigantic water wheel just a few minutes down the road. They sell it, along with cornmeal, to help fund the mill’s educational programs and it’s SUCH a delight to have locally grown and milled wheat available to us, not to mention the historic aspect of the fact that it was ground in a mill that’s 250 years old! In order to make the meal just a little more healthy, we added the side of strawberries and yogurt. The coffee? Not local, but I dare you to tell me that I can’t have it with breakfast. I did mention this was a two-fer, right? 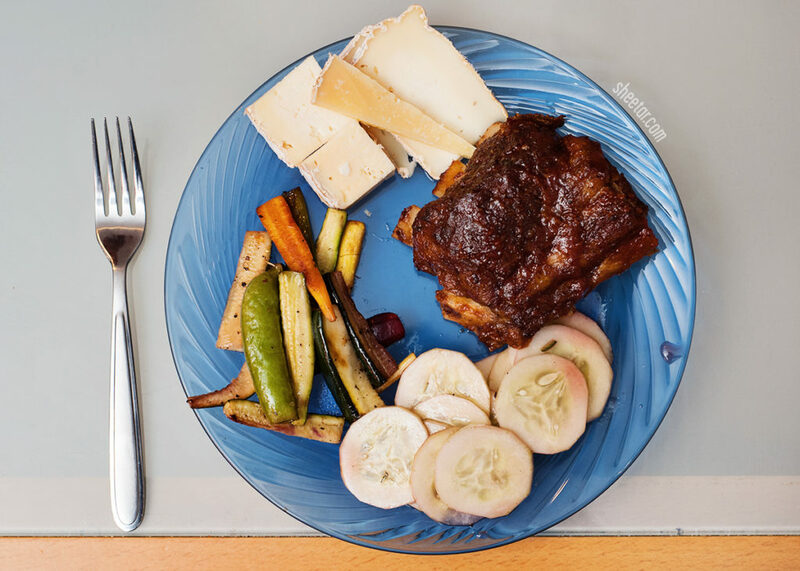 Second local meal for the week features ribs with grilled vegetables, a cucumber salad and CHEESE. The ribs were cooked in the slow cooker first and then given a quick roast in the oven with our own homemade fruit ketchup using tomatoes and apples from the farmers market and peaches from our own tree. Pretty sure this is the same recipe we used from the Ball Canning Book for the ketchup. The veggies on the side were carrots, snap peas, and zucchini. Then there was the classic cucumber salad – cucumbers soaked in vinegar making not-quite-pickles, but a nice refreshing not-lettuce sort of salad for the side. Then there’s the CHEESE – I believe that’s all Birchrun Hills cheese between Fat Cat, Red Cat, and some Clipper. REALLY a good dinner – the ribs were absolutely perfect and it was a nice way to end a stormy evening. 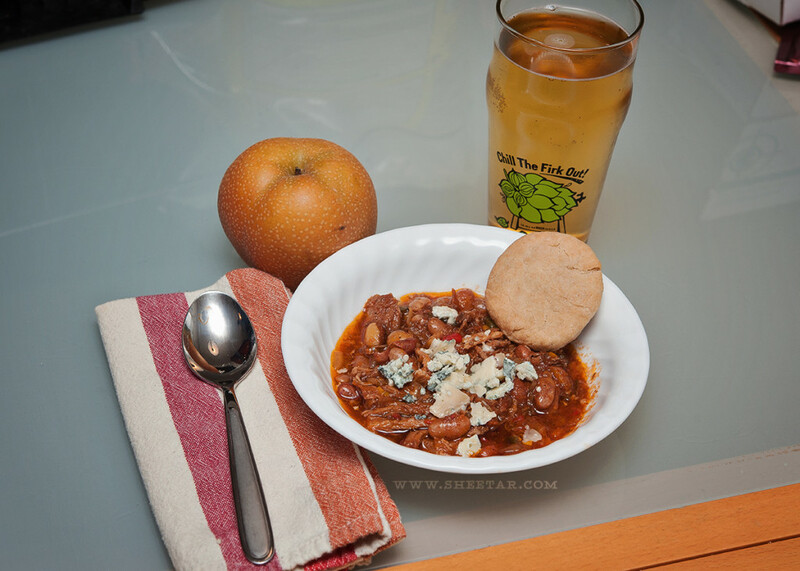 The weather turned crisp and cool over the past week, and I decided it was time for chili! Usually husband is the chili master, but the pork shoulder was on special sale at the farmer’s market, so I went for pulled pork chili done up in the crock pot. I used the remainder of the leftover tomato sauce, added some spices, onions, and peppers and let the whole thing simmer for hours until the pork fell apart. I added some beans towards the end, and topped the whole thing off with blue cheese and a biscuit from that biscuits and gravy breakfast. 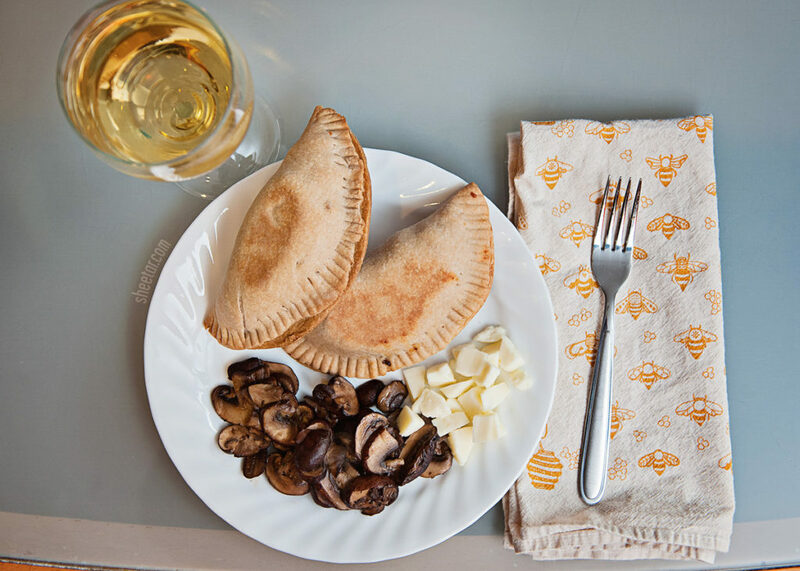 A juicy asian pear on the side and a glass of homebrewed cider, and we have a meal! It was just the thing for a cool evening.